One of my earliest childhood memories of food is that of soup. My mother concocted the most delicious, soul-warming soups for our family. Her chicken soup remains in my dreams, for she would make it with a hen my father butchered from his dozen chickens. Always he kept twelve chickens in the spacious coop and fenced yard within our orchard. Fresh eggs, roasted chicken, and the ubiquitous soup were all culinary events from those erstwhile hens. Whenever my Ohio relatives were commencing their drive to visit us, my Uncle Joe, whose parents were Sicilian immigrants, would phone my mother and say, “Kitty, toss another cup of water in the soup! We’re on our way!” He knew full well soup would be on the menu, with pasta served for the next day’s dinner. Soup is elemental, and it always makes sense, even when the world around us fails to. Frequently the world makes little sense, but soup atones for that. No matter how bad a day, regardless of disappoint, in spite of strife, and with little money, soup remains a constant presence that sustains us. With meat or without, with few or many vegetables, with a vegetable, or chicken, or beef broth, soup can be made from very little. My mother used to add either cabbage or Italian greens such as mustard greens, escarole, or dandelions to the carrots, onions, celery, tomatoes, beans, and chicken simmering away in her homemade chicken broth. When I learned of the cookbook, Soup for Syria: Recipes to Celebrate Our Shared Humanity, by Barbara Abdeni Massaad, I knew I needed to purchase it. All of the proceeds are given to non-profit organizations for food relief efforts for Syrian refugees. The author has tapped into her extensive network of famous chefs, like Anthony Bourdain and Yotam Ottolenghi (author of Jerusalem, an amazing cookbook) to name only a few of the many contributing chefs. Massaad was born in Beirut, Lebanon, yet grew up in Fort Lauderdale, Florida, where her father owned a Lebanese restaurant, although she now resides in Beirut. Next to Italian food, I count Lebanese food among my favorite cuisines; therefore, I became interested in Massaad’s cookbook, Man’oushé: Inside the Street Corner Lebanese Bakery some years ago. She is active in the Slow Food Movement, founded by Italian Carlo Pettrini. The movement focuses on preservation of traditional and regional cuisine in support of sustainable foods. It sounds like how my father and mother parlayed his abundant garden into soup, and filled our large freezer with vegetables and chicken years ago! 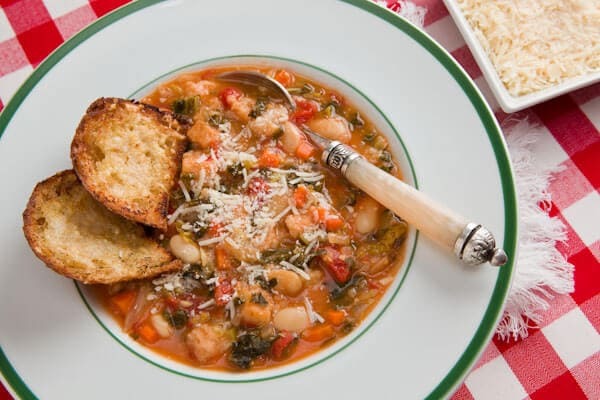 Tonight I am serving Ribollita, a hearty Florentine soup I made this morning. Prior to ladling up bowls of Ribollita, I will lay toasted Italian bread in the bottom of the bowls. ‘E buona!